I've seen so many people complain that this feature isn't on the E71, but indeed it is. You just gotta read the instruction manual, or follow this blog. Say you need to dial 1-800-Flowers in case you got yourself into some girlfriend/wifey trouble. 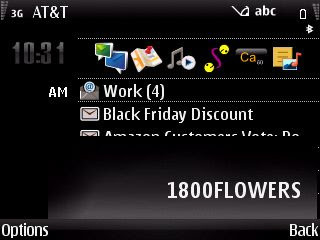 Dial 1800 like normal, then tap the Function button to put it in text mode, let go, and hold down the SHIFT button while typing out FLOWERS. Make sure it's in ALL CAPS or this won't work. Push the green call button. DONE! - Holding down * Turns on/off bluetooth. - Launch browser from homescreen: Hold down "0" Zero key. I know there are a million more shortcuts to remember. This article can serve as a refresher. What are some of your commonly used shortcuts on your Nokia E71? By the way, Happy Thanksgiving to everyone. It's Turkey Day here in the States! Time for a feast.